Dodo Cheng is the founder of Sharing Kitchen HK, a social enterprise and food production platform that seeks to empower grassroots women by connecting them with local restaurants. By gaining access to restaurant kitchens during non-peak hours, Sharing Kitchen enables women with a passion for cooking to realize their dream, earn a living, and contribute to society. So far, six restaurants have pledged their support to the project by sharing their kitchens with underprivileged chefs. 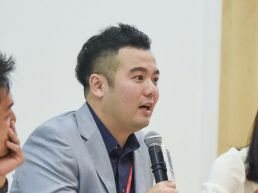 Exploring the idea of using a sharing economy concept as a way to uplift grassroots communities, Cheng realized that he could mutually benefit underserved individuals and businesses by creating a “sharing kitchen”, which would provide flexible job opportunities to talented home cooks while taking advantage of underused restaurant space during off-peak hours. Two years on, Cheng has not only witnessed the success of the venture, but more importantly, the impact it has had on the individuals themselves. “Empowerment is key as it allows people to really take charge of their own lives by doing something they love, which encourages self-sustainability,” says Cheng.